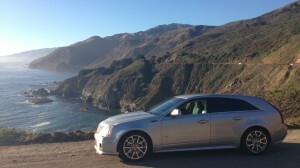 V Wagon Roadtrip: After 3500 Miles, How’s It Holding Up? 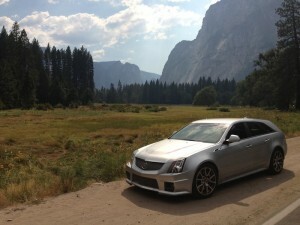 We put roadtrip mile number 3,500 on the V Wagon in Yosemite National Park today. Three thousand five hundred miles. In ten days. Maybe this number seems reasonable to you. Maybe it doesn’t sound so bad. Maybe it sounds like child’s play. If that’s the case, maybe you’re a long-haul trucker, or possibly an astronaut. As 3,500 miles is a lot of driving in a week and a half, I keep receiving the following question: How’s the car holding up? I was asked this at Pebble by people I didn’t know. And the answer is … well, let’s examine that in detail. We’ll start in front, home to the headlights, the grille, and the 556-horsepower V8 that’s tuned to sound like a small 6-cylinder, or maybe a window-mounted air conditioner. All of that stuff is fine. The front bumper isn’t quite so lucky: two small black plastic pieces meant to protect the lower bumper from scratches have come loose. But the prognosis is good. It looks like they can be reattached by someone with greater mechanical knowledge than me, a group that’s defined as anyone whose abilities extend beyond a) plugging in the iPhone before bed, and b) unplugging the iPhone in the morning. The brakes won’t be so easy to fix. Despite visiting my dealership four days before I left and announcing I would be driving the car 5,500 miles in the next three weeks, I discovered the brakes needed replacement about nine hours after I left. I’m pretty sure the rotors are warped, because stopping at high speeds feels like driving over fallen logs approximately 19 feet in diameter. The last nuisance is the passenger-side rear tire, which was the reason for my dealer visit before the trip. The old passenger-side rear tire was losing air, and the dealer said it had a small leak. So I paid $470 to put on a new tire, which is now leaking too. Some coincidence, wouldn’t you say? At this point, maybe you think I’m complaining. You might think: DeMuro, you think you have tire problems? Come to my place and we’ll do burnouts until you’re driving on the rims! But really, I’m not complaining at all. Driving 3,500 miles in 10 days, I expected more issues. In reality, the car only has three problems: one minor (the plastic bumper pieces) and two that should’ve been solved before we left. Other than those, it still starts, runs, drives, turns, and accelerates just as it did when we left. The only real difference is the interior smell. You can imagine. As for the trip itself: if you’ve been following my updates on Twitter (and you should be), you’ll know we’ve already started making our way back across the country. Since I wrote last, we hit LA, Santa Barbara, the beautiful California Highway 1 along the Central Coast, and, of course, Monterey Car Week. Yesterday was Yosemite, and today begins the long trek through the Nevada desert. Unfortunately, the shorter distances and frequent stops have taken a toll on the V Wagon’s gas mileage. 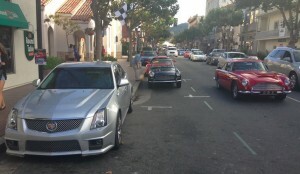 During Monterey Car Week, I averaged – this is entirely true – 11.22 miles per gallon. If you’re thinking that’s because I did burnouts up and down Ocean Avenue in Carmel, you’re mistaken. I wish I had done burnouts. But that wasn’t possible for the same reason the gas mileage was so low: traffic. For those of you who have never been to Monterey Car Week, you see photos of shiny vintage cars and exciting unveilings and you probably think: This must be so cool! The reality is much different. Yes, there are shiny vintage cars. And yes, there are exciting unveilings. But that stuff is mostly forgotten because you spend half your time sitting behind rented minivans in traffic that’s so bad you might think you’re in New York City during a transit strike. Seriously: at some point, we spent 30 minutes on one four-mile section of 17-Mile Drive in Pebble Beach. That’s an average of eight miles per hour for those of you who aren’t so quick, such as the people who installed my tire. But the gas mileage should increase in the next few days, as we have some longer distances to cover. To that end, I’m eager to get back on the road. But first, I have to go fill up my tire. Leaky tire = cracked rim? I had that same problem with a wheel… it would always deflate to ~ 20 PSI slowly after fillig the tire. I had same thing happen when I bent a wheel on the inside of the rim. Looked fine from outside, and not enough to even cause a balance problem, but there was a slow leak. My tire place put some kind of sealant on it and it’s held air fine since. Have them look at the TPMS valve stem. They are supposed to be serviced every time the tire is removed. They rarely are and can leak due to the neglect. Many times they are serviced by guys lacking proper training or tool which also results in leaks. Basically, TPMS sensors leak a lot. Two excellent — and expensive!! — potential solutions to your slow leak. And, of course, you have that $500 tire that probably wasn’t needed. IMO, never never never let a car dealer mess around with tire issues. Dougie- I’m mildly amused that Jalop has the newest post before your own site. Contractual? Anyway, it made me smile when you described the poseur attitude of the Cadillac boys. I guess you have to put into play what you’re trying to be. I’ve noticed this point of view is starting to infect the retail guys, too. I worked briefly with an old line factory rep in the late 70′s. He had witnessed the halcyon days of the 50′s and still maintained that dignity and professionalism instilled in them from pride of product. I made the mistake of saying “Caddy” when referring to the car and was sternly told that a “caddy is a guy who carries your golf bag, a Cadillac is a fine automobile”. Maybe these guys are his spiritual progeny. Keep letting us smile. 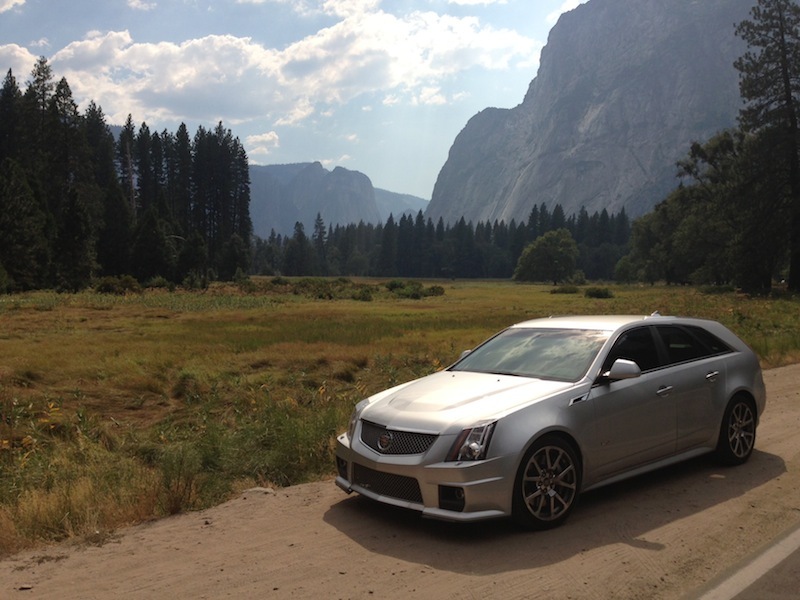 You’re doing what all gearheads aspire to do – the road trip of dreams, even if you’re product challenged. The CTS-V is better than some damn euro trash driver, though, so props for that. Hah – not contractual, and it fell off the Jalopnik main page for bizarre technical reasons. I often have trouble getting them to share my stuff; from now on everything will appear here too. Looking back, I wonder if the attitude was more along the lines of ‘we’re engineers here doing a job and we don’t want to be disturbed or photographed.’ Frankly I’m glad we didn’t end up talking because any delay would’ve meant fewer runs before the rain came. I’m just going to guess that you’re in your 60s if you’ve been telling that yoke since 1973..
I’m enjoying living vicariously through these posts. Keep ‘em coming! Hah! The joke has been told at every car journalist function I’ve been to. I can only ASSUME it’s been told since then! The posts will keep coming indeed!